After three and a half days at the Mars Desert Research Station, my crew and I have settled into a routine familiar to any Mars pioneer. Every morning we have a meeting to discuss the day's activities. Then we break up to finish any chores, projects, or EVA preparations. In the late morning, the first EVA commences. While that team is out in the field, the others are back in the Hab working on other things and finding some time for exercise. In the afternoon, we switch so the other three people can go on an EVA while the first three stay back in the Hab and try to get caught up on their tasks. You can learn more about MDRS living here. Boredom is the last of our worries. As I learned at FMARS, overwork and information management are concerns. By dusk when we're all back inside, it's a mad rush to get all of the reports written by 8pm when Mission Support comes online. It usually takes most of the night to sift through all of the photos, select the best ones to post online. We never have time to finish everything on our to-do lists, so we have to prioritize what is most important and leave other things for later. We do manage to carve out some time for fun too. Yesterday was Mike's birthday, and in honor of the occasion, Carla cooked a tasty chocolate cake. 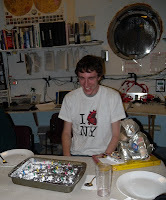 Mike blew out the candles and nearly set half the crew on fire when the powdered sugar ignited. After a good laugh (seeing as no one was hurt), we opted to spend the rest of the night playing Trivial Pursuit. It was a good crew bonding experience. Today we ventured farther from the Hab on our rovers to explore the geology and biology of the area. 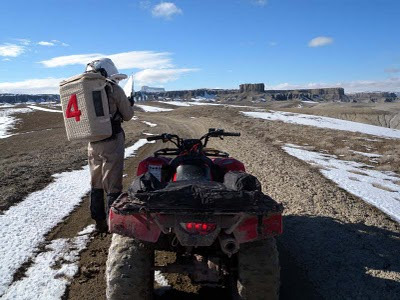 Kiri led Darrel and me on EVA 5 north of the Hab in search of the Schiaparelli Huge Fossil Field. It took us nearly an hour to suit up for the EVA, since it was our first long distance EVA. This meant we had to bring safety gear like a first aid kit, jumper cables, a tow rope, as well as some emergency food and water. We also connected the water bladders to our helmets to allow for drinking during the EVA. The water bite values interfered with the radio microphones, and we may consider bringing them into the helmet from the left rather than right side for future EVAs. Navigation was very difficult despite having programmed waypoints in the GPS and taking a map. We lost the muddy trail a few times and never made it to the intended destination. We did, however, come across a huge bed of Gryphaea, which are fossilized oysters commonly called "Devil's toenails."